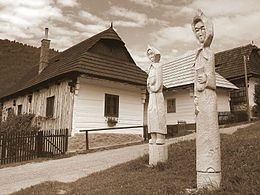 Vlkolínec, situated in the centre of Slovakia, is a remarkably intact settlement of 45 buildings with the traditional features of a central European village. It is the region's most complete group of these kinds of traditional log houses, often found in mountainous areas. This article uses material from UNESCO World Heritage List article "Vlkolínec", which is released under the Creative Commons Attribution-Share-Alike 3.0 IGO License.